We are now taking reservation for 2019 mated Buckfast cross queens. £5 deposit is paid to reserve your queen, the balance of £31 will be invoiced when the queens are ready. Please do bear in mind the dates are provisional and the weeks may slip back depending on the weather. As soon as we have information on dates we will email you with an update. 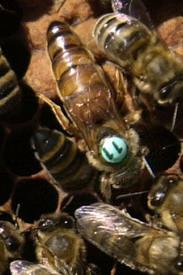 The Buckfast bee, often referred to as the renowned Brother Adam bee is a cross of many strains of bee from Brother Adam's search for the most ideal bee with the development of the Buckfast breeding programme. It has a colour variation that is quite unique. The colours can vary from very light to stripy to very dark, this is no doubt as a result of the wide genetic pool used to keep the variability of the Buckfast strain. Regardless of their colour, the spring build up and over wintering abilities are the same. These Buckfast crosses come from our breeders in Greece who have breeding for many years to increase resistance to disease. 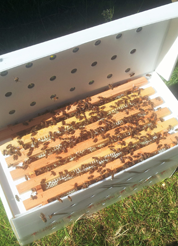 The queens are open mated, they have a boundless capacity for foraging, as well as being very hygienic bees which goes hand in hand with their genetic disposition for disease resistance They are very nice to handle with a lower swarming tendency As with all hybrid queens the second generations can be quite different depending on what drones they mate with.